George Graham Reviews Hem's "Eveningland"
It seems that almost every generation complains about the state of the next generation's popular music, and how "kids these days just listen to noise." Classical fans lamented the advent of jazz, fans of jazz and big-band music were up in arms about rock & roll. Devotees of early rock decried the psychedelic sounds of the 1960s. Many rock fans were turned off by punk, and rap illustrates a generation gap from soul music. But just when the music seems to be getting more aggressive, there are performers who come around and mellow things out. And with so much of commercial pop music being so "in-your-face," trying to cut through the clutter and din of the commercial media, there seems to be a kind of reaction against that going on, with a number of younger bands appearing who seemed determined to move in the opposite direction. The movement seems to be drawing its inspiration from the late British singer-songwriter Nick Drake, and includes Everything But the Girl, who themselves go back to the 1980s, along with younger groups like The Kings of Convenience from Norway. This week, we have the sophomore release by a fine American group who go about as far as one can away from aggressive rock, with introspective music accompanied by a string orchestra. The hand is Hem, and their CD is called Eveningland. Hem started in New York in 1999 when two friends, songwriter and keyboard player Dan Messé and producer, engineer and guitarist Gary Maurer decided to collaborate on an album, with a kind of Americana theme. They added guitarist Steve Curtis and decided they needed a singer. They placed an ad in the Village Voice looking for a vocalist, and proceeded to receive what was described as "an onslaught of bizarre demos," before Sally Ellyson who described herself as not really a singer, sent a tape of her singing lullabies a cappella. The recording captivated Messé and Ms. Ellyson was invited to join, thus the band Hem started. They began recording what was supposed to be a low-budget project, but it soon took on a life of its own with Messé going to the point of selling off many of his possessions to pay for hiring an 18-piece orchestra to appear. The result was a thoroughly delightful album called Rabbit Songs that was able to walk the fine line between being mellow and introspective but not being overly sweet or schlocky with the string arrangements. Their new CD Eveningland continues the sound, and if anything, is even more laid back their previous recording. But this time the string section has grown to a full orchestra, specifically the Slovak National Radio Orchestra, recorded in the Bratislava, Slovakia, where it's possible to hire a world-class orchestra for a lot less money than in the US. This CD also lives up to the intent behind the original formation of the band, bringing in some Americana and hints of traditional folk music with mandolins and a curiously country-influenced steel guitar, while Ms. Ellyson's attraction to lullabies also comes to the fore with several pieces that could serve as lullabies, both musically and lyrically. The string orchestra is heard on virtually all the tracks, but their presence is subtle and very tasteful, in contrast to the usual use of strings in so-called "sweetening" pop music. Hem's personnel remains as on the last CD, with the four extra musicians of the Rabbit Songs now being a regular part of what is has become an eight-piece band. Eveningland is a generous CD with 16 tracks, but it is a more homogeneous recording than the band's debut, with many of the pieces having a similar sound and similar lyrical themes. But the band sets up such a pleasant and appealing aura that one doesn't mind the relative sonic uniformity. As on Rabbit Songs, the focus is on Ms. Ellyson's wistful vocals, which possess a combination of innocence with restraint and subtlety. 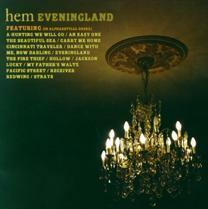 Eveningland, the new second CD by the New York-based band Hem -- now an octet -- is another delightful recording of mellow, introspective music that is supplemented by full orchestra. The CD is marked by its good taste and subtle use of the strings, which could easily have turned this into just so much musical saccharine. The combination of Ms. Ellyson's attractive vocals, and the pleasing songs, makes for music of considerable beauty, but with enough quirks, like the presence of the steel guitar, to make it interesting. The material is more uniform than their last CD, and the general level of quality higher, but the CD's homogeneity also makes it more of an album you're likely to use for background listening than one to crank up and devote your full attention to. In that respect the CD's 53 minute length is an asset. Our grade for sound quality is a "B". The mix has everything in the right place, and the string orchestra is recorded and integrated well with the rest of the instrumentation, but the band's acoustic instruments have a noticeably compressed sound, even though the overall dynamic range of the recording is somewhat better than the dismal contemporary average for pop albums. While the aggressive side of pop music seems to find its way up the charts, there are others who are carving out a quiet, mellow zone. Hem is one of the best of the current generation.